In this post I want to bring a new mining term to your attention: altered gold placers. If you're not familiar with this term and what it means, then read on because you've come to the right place. Many older or more ancient placer gold deposits have undergone significant change over the course of time. In general, this change has been the result of large-scale geological events such as earthquakes, volcanic activity, violent uplift, and extensive erosion. 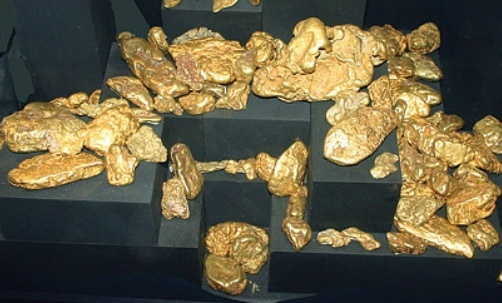 Often, these "altered" placer deposits still contain rich gold values that patiently await those inquisitive and persistent gold prospectors and miners willing to do their research and no small amount of legwork. Some of you out there are undoubtedly saying to yourselves that "This ain't nothing new. Old J.R. is yakking about Tertiary Channels again." If this is indeed the case, then you're both right and wrong my friends. You see, Tertiary Channels (or ancient rivers of gold, if you prefer) are only one manifestation of what altered placers are, or can be. Granted, Tertiaries like those found in Northern California's "Great Blue Lead" are some of the most dramatic (and gold rich) altered placers that have ever been discovered and worked, but many other types of altered placers exist in various parts of the United States and other countries as well. Altered placers start out just like any other wet or dry placer...as stream or dry wash gold deposits formed primarily from ledges, veins, reefs, or stringers of gold that have been subjected to their own forms of alteration, with erosion a key component. Yet two main characteristics separate altered placers from the existing placer deposits most of us work and are familiar with. These are 1) their age and 2) the geological forces they've been subjected to. Some of you wags out there are smiling and saying to yourselves, "Well hells bells. Every gold placer out there is being altered to some degree all the time by water flow, erosion, and flooding." Very true. But as a counterpoint let me refer you back to the two characteristics I just mentioned in the previous paragraph and the light bulb should start blinking inside your feverish brains. That little creek you're working each weekend is, I suspect, much "newer" in geological terms and because of this hasn't been subjected to the major geological forces that give birth to true altered placers. Moreover, the alteration you're speaking of is more directly linked to the physics of gold deposition than it is to the formation of altered placers. Make sense? True altered placers come in all shapes, sizes, configurations, and relatively richness. Some are small and quite limited while others are massively extensive and impressively rich in gold. Again, California's Tertiary Channels are a good example of the latter. What links each altered placer are again, the two characteristics I mentioned already...age and the nature and extent of the geological forces that shaped them. This geological "shaping" can be a two-edged sword when it comes to locating and working altered placers. Erosion and the earth's upheaval and shape-shifting dynamics can either expose all or part of an altered placer deposit or bury that same deposit under hundreds of tons of earth and rock. A good number of altered placers in the Western and Southwestern U.S. have also been "capped" by lava flows as a result of more recent geological activity. Needless to say, this makes things very tough for small-scale gold miners like you and I. On the other hand, if you were to find just one small exposed section or length of a true altered placer chances are you'd be working virgin ground for the first time in your mining career. And if that premise wasn't direct enough for you, I'll put it another way. You'd probably get more gold from that one section of altered placer over a shorter period of time than you would from any dozen well-known (and overworked) placers that you've been banging away at for years. Quick fixes won't work when it comes to tracking down a true altered placer. You're going to have spend your down time reading and researching, especially dry old geological bulletins written by those PhD's you love so much. You'll have to be part prospector, part miner, part geologist, part researcher, and part detective and once that's over, you'll have to bust your hump like a 3rd-World coolie to get at all that gold. You see, some of these altered placers will have been left high and dry hundreds of feet above existing gold areas, others will be buried under tons of debris, and then there are those that will be covered by trees and vegetation and well hidden from view. That altered placers exist is not up for debate. What is, however, is your willingness to seek them out and get on the good gold.